Yes, I am Complaining about Chocolate. What kind of a guy complains about chocolate? Me, apparently. Having spent some time in Europe, I got accustomed to this very civilized idea that your coffee should be served with a small chocolate. The idea now seems natural: a little sweet taste on the palette nicely balances the slightly bitter taste of coffee. Just picture sitting in a cafe in Paris on a pleasant Spring morning… ahhhhh. I am apparently not the first inquiring mind to wonder about this. Now, I am not an expert in chocolate although I have eaten my fair-share over my many years. Who hasn’t, right? My preference is for darker chocolate, or semi-sweet, preferably with almond. I will enjoy milk chocolate but it will never be my first choice. The Lindt Swiss Miniature Bars seemed like a great candidate for the goal at hand – that is, the goal of eating a small chocolate with coffee. I used to walk past a Lindt store every day with the bins filled with bulk small chocolate squares and figured this would be perfect. The store was so shiny and pretty. I had visions of me prancing around in there like Homer Simpson in his dreamy escape to the Land of Chocolate. Obviously, I was disappointed enough to spend 15 minutes writing about it. Not unlike the sampler box referenced in this paragraph, I grabbed a variety of different kind of squares from the bulk bins. I really found the flavour to be lacking. Not enough cocoa, maybe? But, strangely it was neither sweet nor bitter – just lacking in any kind of flavour. This is not really an argument about whether high cocoa chocolate is better than sweeter, it is about any kind of taste at all. And, there were at least five (5) different kinds in my bulk grab-bag. A better idea came later when it dawned on me that chocolate bars are usually scored to make it easy to break off small pieces. This is when I replaced the crappy bag of Lindt chocolate with something a bit more refined, which was the Black and Green Organic Chocolate Bar with Almonds. It was at this time that I realized why I wanted the individually wrapped ones: I wanted a morning treat with my coffee, not an exercise in will-power. Small chocolate square. No flavour. Ugh. 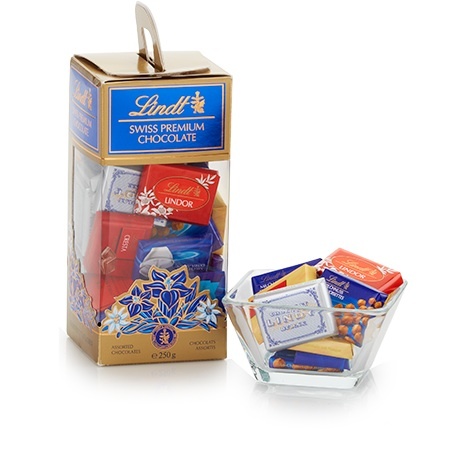 The bottom-line: If you want to have that chocolate treat with your coffee, don’t go with the Lindt squares. Just keep searching.